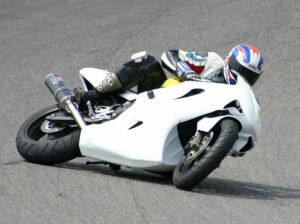 The ability to lean a motorcycle with confidence is a fundamental part of riding. Unfortunately, humans do not come hardwired to lean much more than about 20 degrees, which is the lean angle where we start to lose traction when we run in a circle on grass or dirt. 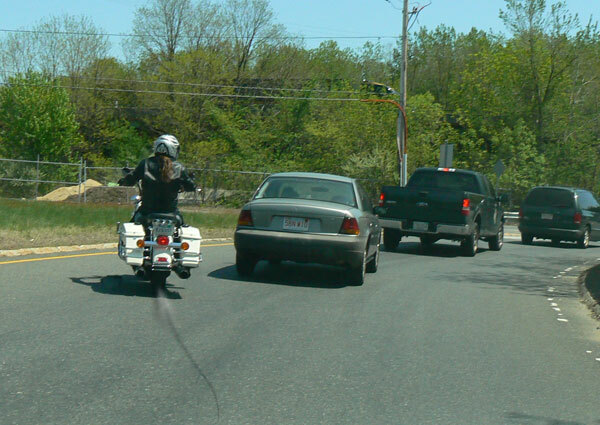 Motorcycle riders must get beyond this lean angle limit for even basic maneuvers. This requires a leap of faith that the tires will grip. Practice is important to train your mind and muscles to lean beyond your comfort zone so you will be able to lean more if necessary. Once greater lean angles become more comfortable, the next skill to refine is timing so you reach maximum lean angle at the right point in the corner. Paul Duval is the latest RITZ guest writer. 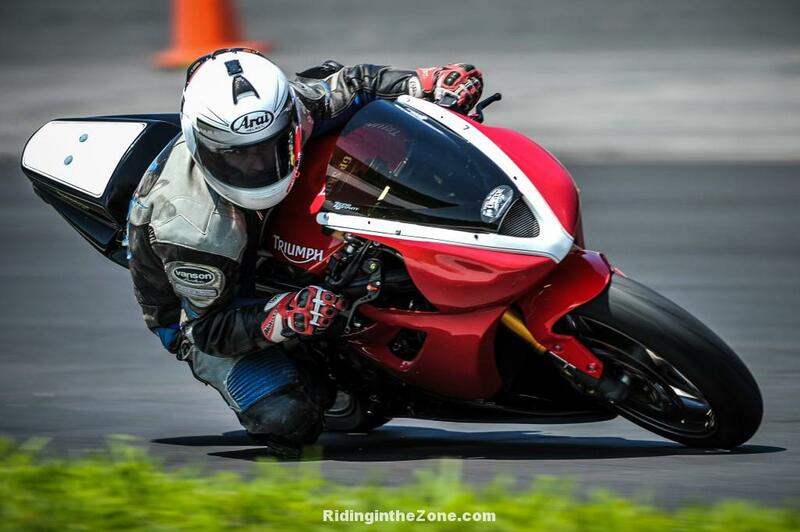 Paul is a fellow track day and MSF instructor, former Loudon Road Racing Series 125 GP Champion, and professional educator. Let’s listen to Paul’s take on the importance of accurately timing maximum lean angle. After many years of racing and instructing on the racetrack, there is one persistent mistake I see riders make when trying to ride faster: Using too much lean, too late in the corner. Who is making this mistake? Everyone is susceptible to this problem. 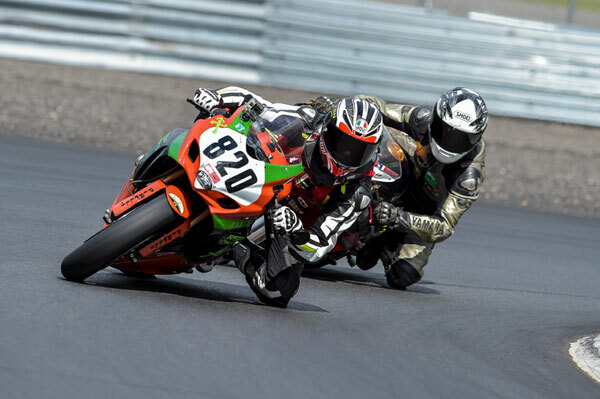 Novice and intermediate track day riders often make the mistake of increasing lean angle late in the corner in an attempt to get their knee down. Especially vulnerable riders are those with a lot of “natural talent” who got fast so much more quickly than everyone else. They end up riding fast, but without the knowledge and precision necessary to manage that corner speed. Adding throttle and increased lean angle at the same time is a bad idea. You may say, “What’s the big deal, I’m knee down and cranking? !” Yes, you may be fast, but this mistake WILL eventually lead to a crash, and probably a BIG one. The problem with reaching max lean angle well after the apex of a turn is that this is precisely where you want to be on the gas. Other riders will be already picking the bike up and driving hard. This will encourage you to match their drive, but you are still adding lean angle. Remember this: Adding lean angle AND throttle at the same time is how high sides happen. The opposing forces of changing direction and accelerating can easily exceed available traction and will cause the rear tire to slide. When this happens, slides are extremely quick, unpredictable, and hard to recover from. All of your momentum is going exactly the wrong way. There are a few reasons people make this mistake. – Weak countersteering skills: Newer riders haven’t yet mastered the “quick turn” technique of using counter steering to get the bike leaned over. They bend their motorcycle into the turns gradually and often pass the apex entirely before the bike has changed direction. Now they are running out of real estate and HAVE to lean it over to finish the turn. – Lack of reference points:Beginner and Intermediate track riders often use other riders as their reference points. This leads to a lot of crazy entry lines, none of which help the rider get the bike to change direction before the apex. They commonly ride around the entry point as well as the apex, then crank the bike over to finish the turn. – Charging the corners: Faster riders who make this mistake are at the most risk. They rush into the corner at a pace that does not allow them to consistently hit their marks. They will blow by a tip in point, drift wide past the apex, and then attempt to recover to get back on the “fast” exit line by adding a little more lean and a little more throttle. Even with all this effort, they wonder why the faster guys are still pulling away. They aren’t even cranked over like I am!!! Hmmmm??? You may get away with late lean angles for a while, but eventually, you will push this mistake too far. Highside city. The correction for all these riders is pretty similar. And it’s not what they want to hear: SLOW DOWN your corner entry to a speed that you can actually handle. I mean a speed at which you can identify reference points, and ride an accurate line from tip in to apex that allows you to OPEN the corner after the apex, rather than tighten it up. You need to learn to time your throttle inputs and your lean angle so that as you drive out of the corner and standing the bike up progressively as you roll on the gas. BRAAAAP! Wheee! 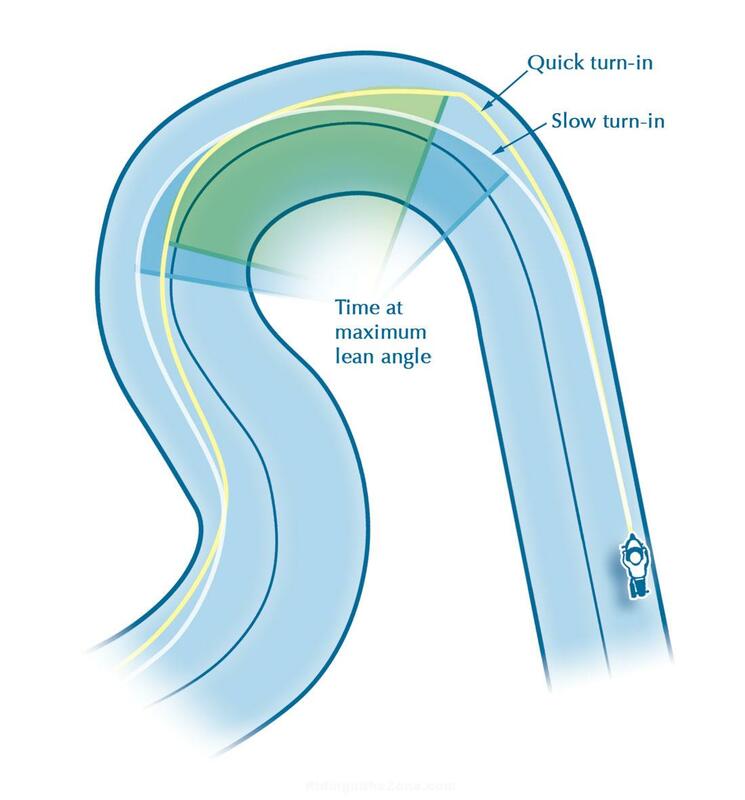 A quicker turn allows early direction change and less risk of an on-throttle highside. copyright Riding in the Zone. Thanks Paul. Paul mentioned the importance of being able to turn quickly. 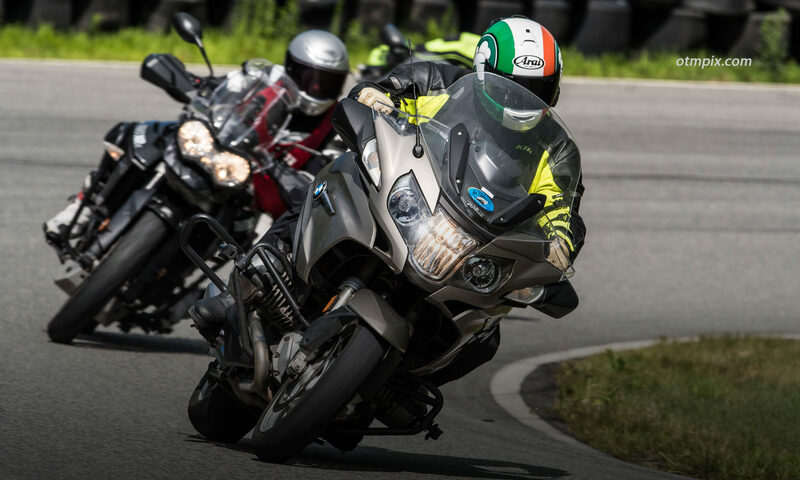 By being able to countersteer with authority, you are able to get your motorcycle from upright to leaned so that the majority of the direction change is complete BEFORE the apex. With the change in direction mostly complete, you can reduce lean angle as you roll on the gas. Traction is managed and all is well. Post your comments below. My wife hates it when I dissect a movie after seeing it. She would say, “Can’t you just enjoy what it has to offer?”. Well, at the risk of alienating my RITZ blog readers who really want to like the “Why We Ride” movie, I will now poop on your parade. Speaking of poop, please take my opinion as what it is. You know what they say about opinions? No? They say, “Opinions are like ***holes: everyone has one, and most stink”. Well, hold your nose because here is my opinion. The trailer gives a good impression of the visual quality of the film, which is very, very good. The videography is beautiful and inspirational. But, what is up with all the slow-mo? I love super-slow motion footage, especially the shots of Moto GP racers dragging elbow. And the footage of the rubber-mounted Harley Davidson XR1200 race bike engines rocking in their frames at idle made me LOL. But, there is a thing called “too much of a good thing”. The slow motion stuff was cool for about half the film, but unfortunately, it went on and on and on and on. And why on earth would you show only slow motion footage of race bikes on the high banks of Daytona and never show how it really feels at over 170 mph? I know plenty of friends who could have provided some awesome on-bike video that would have driven home the craziness of the Daytona banking at speed. All they needed was one or two trackside shots of a bike flying by to paint a better picture. I’ll admit that the super-slow stuff is fun to watch, but it kinda distanced me from what riding is really like. I get that the director was wanting to set a tone of romance and wonder, but for an enthusiast, I was a bit bored toward the middle of the film, partly because the action wasn’t really engaging at slow motion. It comes off more as a parlor trick. The sappy music department worked overtime on this film. Again, I get what they were trying to do, and I’m sure the violin music hit a sentimental chord (ha, ha) with a lot of viewers, but it tried too hard. Mix it up with some raunchy head smacking tunes now and again to represent the vigor that many of us experience when riding. I can understand why they might not want to represent motorcyclists as people who relate to AC/DC (or whatever floats your boat), but everyone knows that motorcycle riders aren’t typical people who gaze with soft-focus at our bikes with violin virtuosos playing quietly in the background. My iPod tends to stream tunes that are a bit less somniatic (It means “puts me to sleep”… and I know it’s not a real word, I looked it up). The message is all about family, fun and adventure. The message this film delivers is “riding a motorcycle is fun”. Duh! I am reminded of the introductory video shown to new MSF students at the beginning of their first classroom session. It’s a lovely little diddy about the joy of riding a motorcycle. It includes many of the same things “Why We Ride” has, including fun action shots (at full speed) and interviews with interesting people. But, the message is delivered in about 5 minutes. 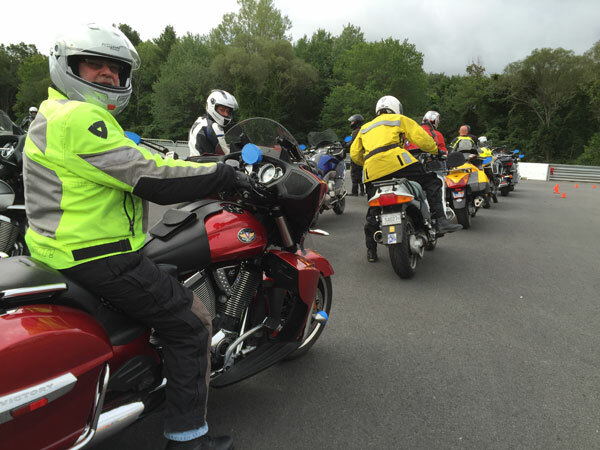 “Why We Ride” took one point five hours to deliver the same basic message. Granted, the film is intended to deliver more than a message, it is also about entertainment (maybe more so). So, in that regard it is worth the extra hour and 25 minutes. Yes. The fun shots of the families and kids are priceless, as are the interviews with some of my motorcycling heros, which makes the film well worth seeing. I was totally loving the film during the first third and then they unmercifully started beating the poor dead horse. I get it, I get it. Riding is awesome and people who DO NOT ride are missing out on life. I couldn’t agree more. It’s a movie that you will want your family and friends to see as an attempt to convey just why you ride a motorcycle. They still might think you’re nuts, but it’s worth a shot. Both enthusiasts and regular people will like this film, as long as you don’t expect a groundbreaking classic here. For that, rent “On Any Sunday” , or if you love roadracing try “Faster” and the sequel “Fastest” (see trailers below). But, that’s just my opinion…what is that smell? How about buying a book? How about buying a t-shirt for yourself or a loved one, or maybe a coffee mug?